It’s not too early to think about next spring’s controlled burns. One point that arises is burn frequency. 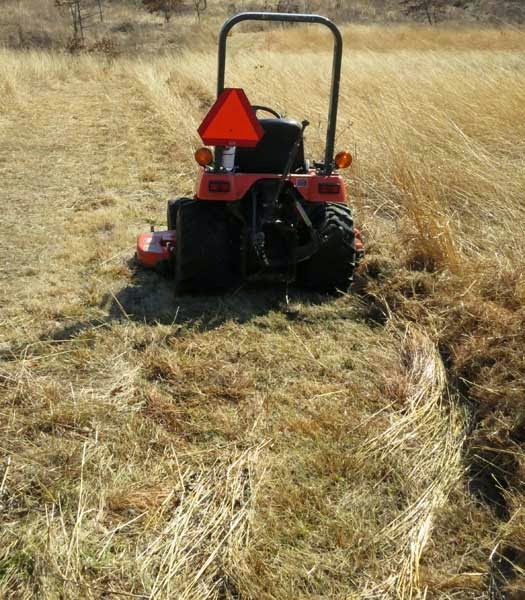 My recent post which analyzed the extensive research by the Konza Prairie group showed that for brush control in tallgrass prairies annual or biennial burns are essential. 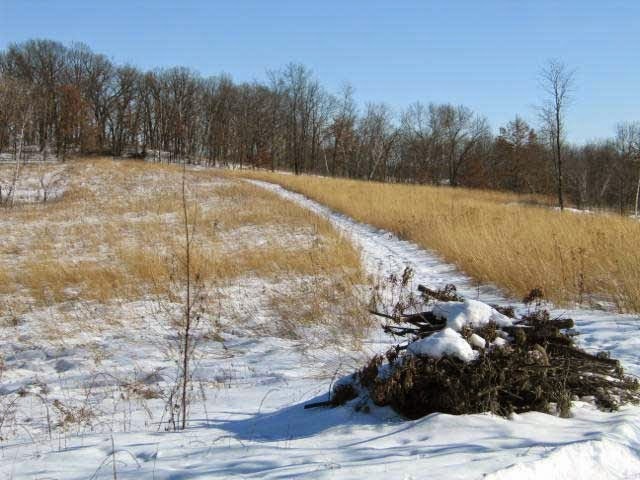 Brush control is only one of the important reasons for burning a prairie or savanna remnant. The other major reason is because the forbs and warm-season grasses demand it. There is a vast amount of research that shows that without fire the species that we most want will have difficulty thriving. One of fire's main accomplishments is to remove the thick prairie thatch so that the delicate new prairie plants can reach the light. The thickness of the prairie thatch varies from year to year depending on the summer rainfall. Sometimes it is so thick that delicate plant seedlings can not find their way through it. A thick prairie thatch from a single year's growth. This is the prairie grass from the previous season, being mowed to widen a fire break before burning. Last year’s growing conditions were very good, so the grasses are lush. Also, snow was light so that the plants remain upright, guaranteeing a hot fire. Concerning the prairie thatch, pioneering papers by Weaver in Nebraska and Rice in Oklahoma are well worth consulting. Rice in particular showed that one role of fire was to remove last year’s thatch so that sun could reach the soil and encourage the growth of warm-season plants. The graph below makes this case very well. Rice, E.L. and Parenti, R.L. 1978. Amer. Jour. Botany 65: 1091-1097. Rice’s burns were done in the spring dormant season. In our own simplified work we divided a well established prairie into two halves, burning one and leaving the other unburned. The result with Toby’s Prairie is shown in the photo below. We obtained a similar result with the Pocket Prairie. Toby’s Prairie divided into two blocks. The block to the right was burned and the block to the left was unburned. The difference in growth of the prairie grasses (Indian grass and little bluestem) is striking. The burn was done on 5 April 2006. The photo was taken on 15 Feb 2007. How does fire act on a prairie? 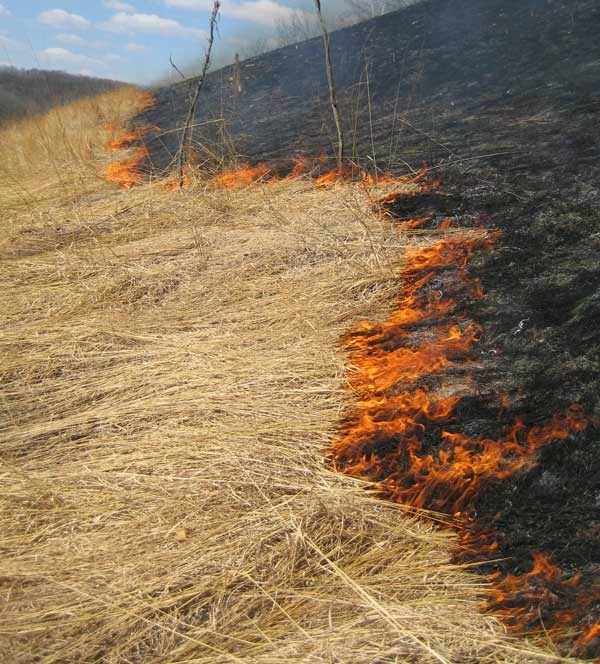 The photo below shows fire backburning through a prairie consisting of Indian grass and little bluestem. After the ashes are blown away, bare soil will be exposed. In this photo, because of the heavy snows the previous winter, the grasses lay flat, thus ensuring that the flame heights are low. The action of fire on dormant prairie grasses. In such a thick mat, delicate prairie plants have a hard time finding the light. Suppose you don't burn? The prairie plants will eventually find their way through the thatch, probably two weeks later. Eventually a new, somewhat impoverished, prairie will form which will form a new layer of thatch. Some of last season's thatch will decompose but not all, so the thatch gets thicker, and in the next year even thicker. Eventually the prairie will reach a point at which most prairie plants cannot survive. But the woody plants can, and eventually the prairie will become some sort of wood lot. Read my previous post for more details on the long-term future of a prairie that is not burned. White-tailed Deer: Another reason to do an oak woods burn! A neighbor scouting for deer in the North-facing oak woods that we had recently burned spotted nine female deer with their heads down, feeding. Eating on what? Acorns, of course. Everyone knows that acorns (hard mast in hunter terminology) are a favorite deer food: “the ecological equivalent of manna from heaven”. But you don’t usually see that many in a woods all together. As I posted last month, this is a big mast year for red oaks, at least at Pleasant Valley Conservancy. The North Woods at Pleasant Valley consists primarily of red oaks, so right now the forest floor is full of acorns. Two weeks ago we burned the whole North Woods. The heat roasts the acorns and makes them more palatable. Acorns in the red oak group taste bitter because of their high tannin content. One way to get rid of the tannins apparently is by roasting. “Acorns roasting on the open fire”? My neighbor also managed to attract two fawns to him by a few of the right type of “clucks”. Pretty tame! 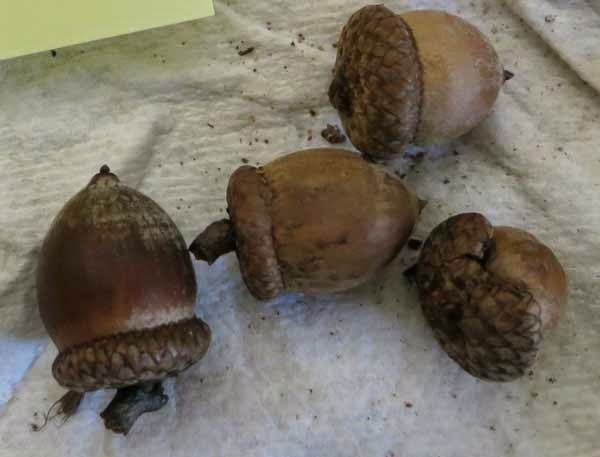 There is a question about the effect of fire on acorn viability. According to some U.S. Forest Service work, temperatures where oak leaves are burning can range from <79 to="">371 C. Viability tests on acorns collected after a prescribed burn showed that “patchy, low-intensity dormant season burns in oak forests reduced the viability of red oak acorns located on the leaf litter surface, but did not generally affect acorns in the duff or mineral soil.” Greenberg et al. Acorn viability following prescribed fire in upland hardwood forests. Forest Ecology and Management 275 (2012) 79-86. In a good mast year lots more acorns are on the ground than needed for oak reproduction. The benefits of fire for oak growth must far outweigh any harmful effects. It may still be possible to see a forest floor full of acorns. Unit 11B, the savanna just south of the upper road, has mostly red oaks, and a few weeks ago the ground was full of acorns. You should hear the ground crunch under your feet as you walk through these woods. Unless the squirrels have already packed them all away! Can a "native" species be called an invader? Whether an invader is native or not is irrelevant. If it spreads into an area, forms monocultures, and results in a marked decrease in diversity, it is undesirable and should be controlled. Here are a few native invaders that under some conditions meet these criteria. Woodland Sunflower can easily destroy the habitat for dozens of native species. So can sumac. Here is a recent review with many examples: Carey, Michael P. et al. 2012. Native invaders--challenges for science, management, policy, and society. Frontiers in Ecology and the Environment. Volume 10(7): 373-381, doi:10.1890/11060 (published online 15 June 2012). Woody encroachment is a major problem throughout prairie and savanna sites in Central North America, and the principal reason for this is insufficient fire. The purpose of this paper is to make a strong case for annual burns on prairie and savanna remnants. The area being considered is that part of the U.S. where the original vegetation was primarily grassland and savanna. Historically, the vegetation was maintained by frequent fire, either from natural or anthropogenic causes. Native Americans burned, and pioneer settlers burned. When the fire-spewing railroads came, burns continued. When the land was cultivated, woodlots and savannas that remained uncultivated were burned to induce “green-up” for pasture. Hill country is especially favorable for fire, because fire readily carries to the top. One match at the bottom may be all it takes. Elderly farmers confirm that they burned every year. A fire often got started as an escape from a burn pile. Burns were generally in spring because grass was well cured and burns well. A fire might even be started in January when there is still snow at the top of the hill. 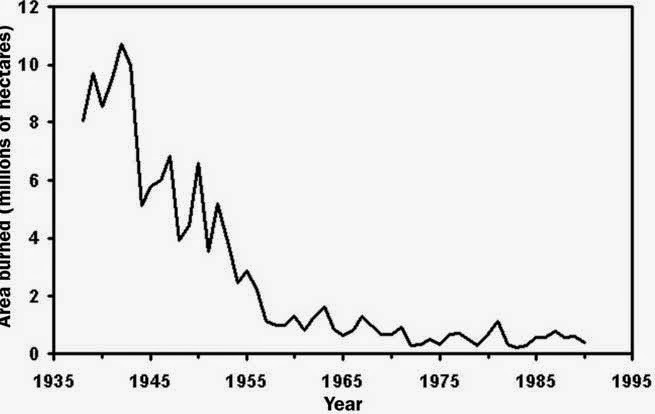 According to a recent analysis by the U.S. Forest Service (Nowacki and Abrams, 2008), in the Eastern U.S. frequent fire continued through the end of the 1930s but gradually diminished in the post-World War II period (see graph). Thus our area had frequent fires until about the mid 1950s. Air photos from that period still show extensive open land, especially in hill country. It takes a while for woody vegetation to get established and take over. However, once enough shade is created, prairie grasses can no longer grow. A “tipping point” is reached after which there is explosive growth of woody plants. Virtually all at once the forest is continuous and grasses are gone. Air photos show that this occurred in our area in the 1960s and 1970s. By the early 1990s most of what had once been open land was now closed. Only scattered remnants were left to provide a poor clue to what the land must have looked like. Why? We are still burning, so what is the problem? We have too many sites and some of them are not being burned. Those that are being burned are often on a three-year burn cycle. If woody encroachment is occurring, this is not frequent enough. How often should we burn? The most extensive research has been carried out by Kansas State University at Konza Prairie in eastern Kansas. 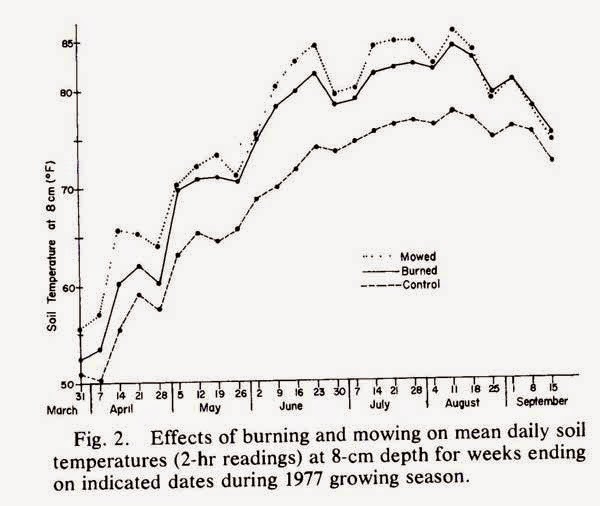 Here a long-term (over 30 years) study has been comparing annual burning with other burn cycles. 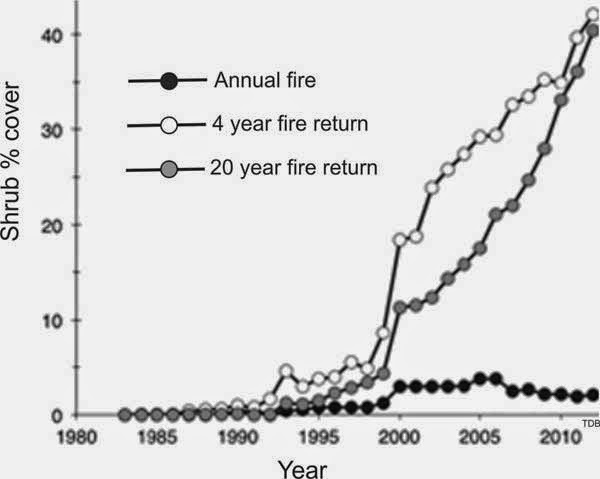 These fire frequency studies have shown that shrub expansion is prevented with annual or biennial fire intervals. A three-year fire interval sometimes maintains a grassland, but not always. And with fire intervals >3 years shrubs consistently become well established and grasslands disappears. The worst offenders are clonal shrubs such as sumac and dogwood. But many prairies are routinely burned on a 3-year cycle without problems of woody encroachment. How can that be? Most of these are planted prairies which have been established in former agricultural fields. There is no woody legacy. These fields formerly had corn or soy beans, were often held in crops for many years, the crops were probably Round-up Ready, and at the time the prairies were planted the fields were completely free of woody vegetation. They may have never seen a sumac or dogwood. Let me emphasize that burning prairies planted on ag fields is quite different from burning prairie remnants. In conclusion: prairie remnants should be burned every year, or (at the least) every other year. If not, the danger of woody encroachment is real, even on a 3-year burn cycle. There is always the possibility that due to bad weather or other circumstances, a year might be missed in a 3-year cycle. And maybe another year? The Kansas work showed that after 5 unburned years, it is virtually impossible to restore prairie to its former state by burns alone. You will be facing a long siege of cutting and herbicide work to get that site back to its previous state. How about savannas? The legacy of woody plants is much more significant in savannas, meaning one must be even more careful. Annual burns must be used, and they must be carried out (probably) for the duration of the site. Briggs, John M., Alan K. Knapp, John M. Blair, Jana L. Heisler, Greg A. Hoch, Michelle S. Lett, and James K. McCarron. 2005. An ecosystem in transition: Causes and consequences of the conversion of mesic grassland to shrubland. BioScience 55: 243-254. Briggs, John M., Alan K. Knapp, and Brent J. Brock. 2002. Expansion of woody plants in tallgrass prairie: a fifteen year study of fire and fire-grazing interactions. American Midland Naturalist. 147: 287-294.